what if this is as good as it gets? : happy days are here again! 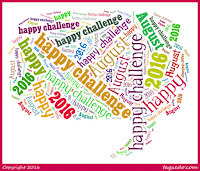 It is time, once again, for the August Happiness Challenge! Thanks to The Gal Herself! "Each day in August you are to post about something that makes *you* happy. Pretty simple. And, it doesn't even have to be every day if you don't want it to be. It's a great way to remind ourselves that there are positive things going on in our lives, our communities, and the world." Sometimes it is easy to forget that we have many things to be happy about. This will be a good reminder!